Etched Glass Beer Tankard Mug - Marked France on Base H5"
Lovely Etched 1 Pint Beer Mug Tankard in good condition. Made in France. 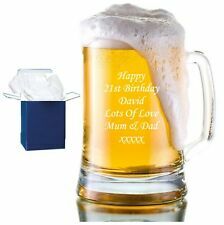 Pint beer mug. Material: Annealed glass. SOLD BY GLASS. Dimple design with clear badge. United Kingdom. Shot Glass Mini Tankard Spirit Glasses. Dimpled glass on the side. Mini tankards for serving shots and spirit. Traditional German design. Top Dia: 3.9 cm. Capacity: 40 ml. Cash on collection is an option from WS12 Hednesford, Staffordshire if local. Dimpled Beer Tankard Britannia Half Pint Glass set of 4. 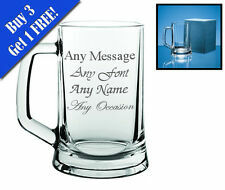 Dimpled Beer Tankard Britannia half Pint Mug. High quality glass half pint glasses.